This color graph is meant to accompany my Graph Beanie Pattern. It features a favorite Valentine’s Day sweets, conversation hearts. 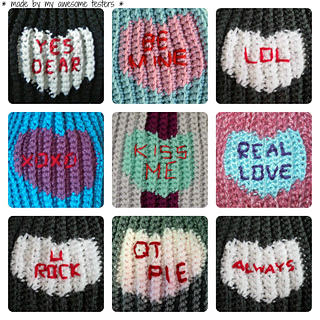 Looking for the Graph Beanie Pattern? Buy this graph plus 2 more and you’ll get a deal! Use the code Pick3Graphs during checkout for $0.25 off each one! Want more? Add 5 graphs to your cart with the code Pick5Graphs and get $0.50 off each one. If you’re really in need of some great graphs, take $0.65 off each graph when you buy 10 with code Pick10Graphs.